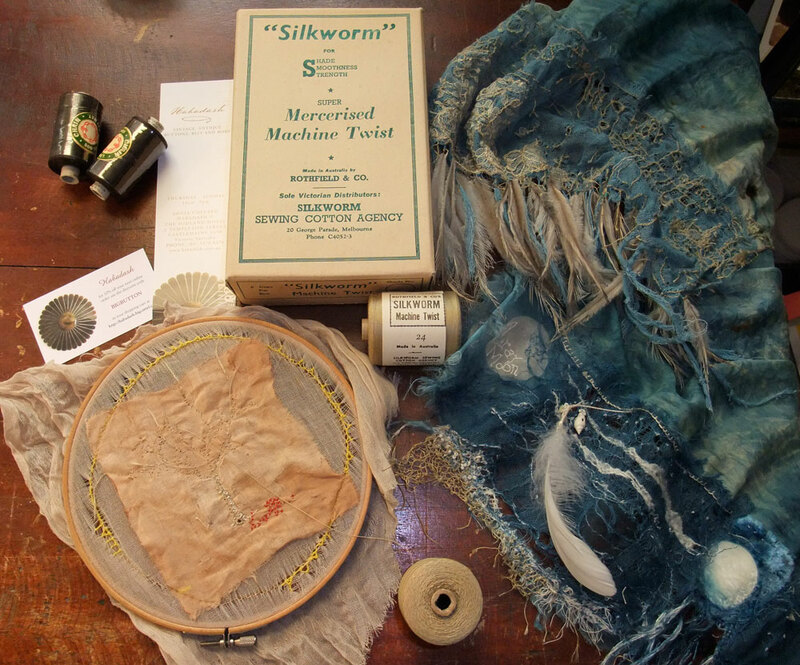 One of the treasures that Margaret Johnson sent with her hopeful bundle earlier this year was the wonderful vintage Silkworm Machine Twist Thread which I used heaps of in the Hopeful Lunacy scarf & found a whole box for sale at the fabulous shop Habadash in Castlemaine, am looking forward to lots of experimenting with needle lace in 2013. 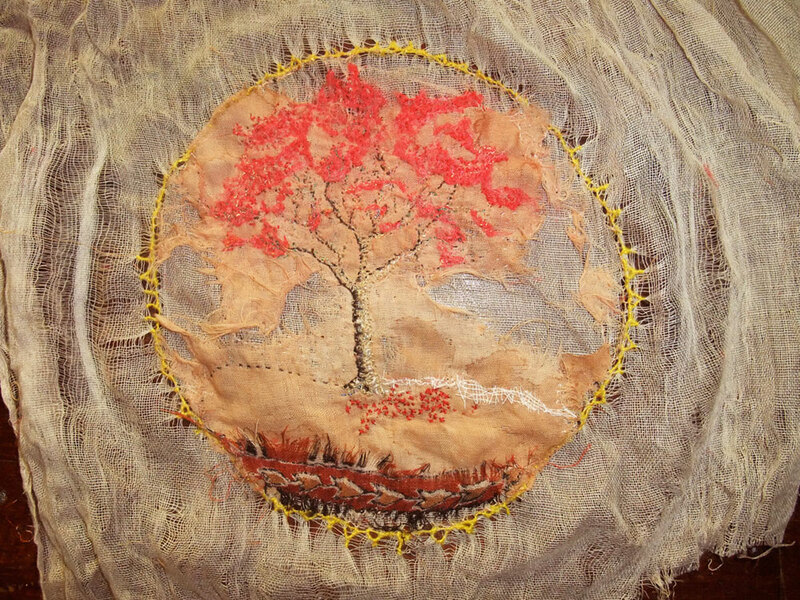 You can see the beginning of a new piece called Flame Tree in the embroidery hoop that was started on the Solstice with echoes of the old Cold Chisel song of the same name after we had seen this beautiful tree on the side of the road. & a few hours later here it is time to put it away and onto song no 17! thanks for having a look Cathy we must catch up for a gallery crawl very soon! Mo, your Flame Tree is exquisite, as is Hopeful Lunacy. You have such a light touch, perfect for such delicate work. I can’t wait to see what you do in 2013. Oh – my – these are magical!! 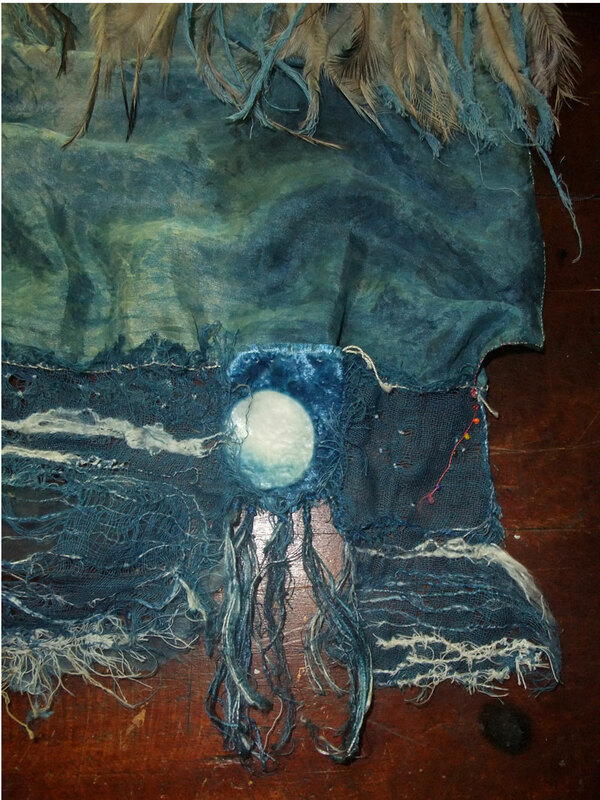 it’s the influence of Jude Hill’s community of cloth conjurors, the magic is contagious! Exquisite work Mo! I have been given an heirloom tablecloth with crotcheted edge made from parachute silk WW2. The corners need to be sewn together and I’m freaking out in case I get it wrong – wish I had your expertise! what a good excuse for us to catch up, I would love to see it! your writing about the ragged edge is one of my favourite pieces Christina, you say it so well, thank you for the link and the good words! 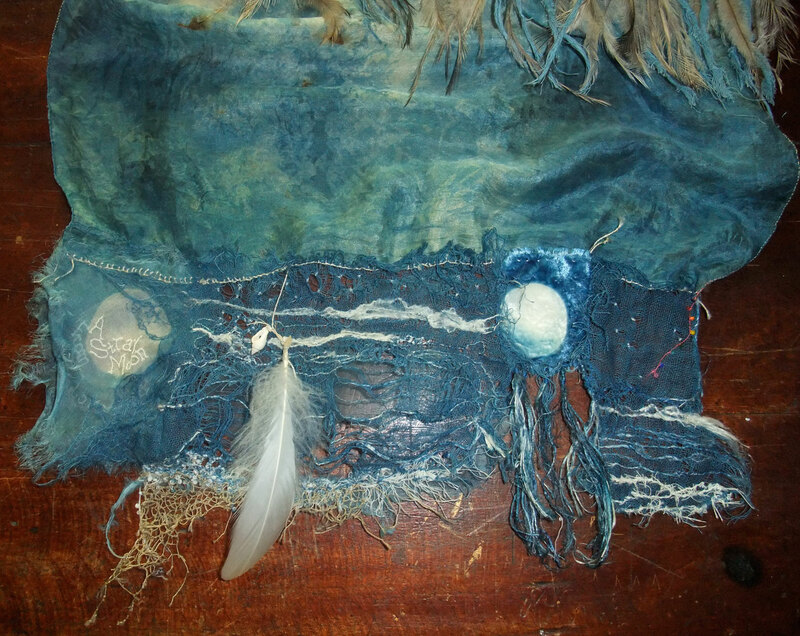 the lunacy scarf has so much to look at; different little bits all over it. it will be an ongoing piece for the rest of my life, there is always room for more hope in the world! i just love that new tree you are working on. are those orange stitches on the tree or is it bits of cloth? lovely effect. Here’s a toast to you and Mike too & a big thank you for all the gorgeous materials! 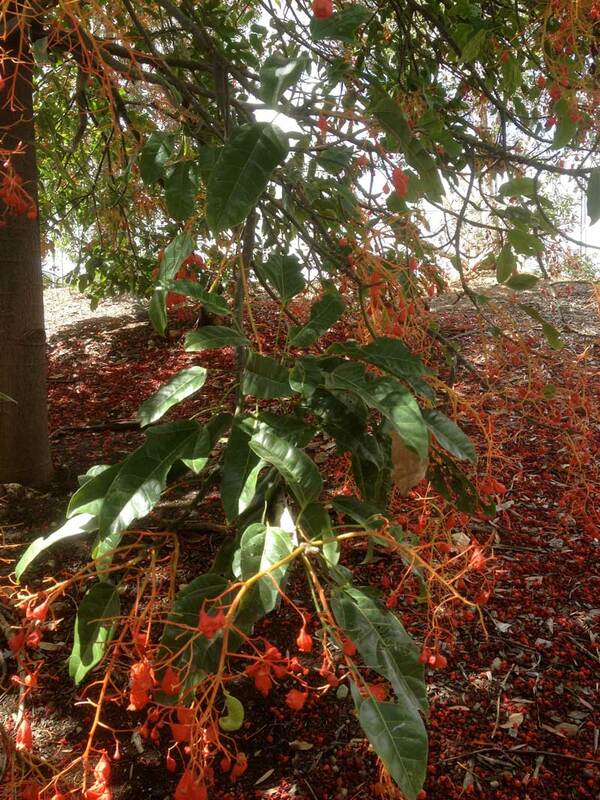 the Flame Tree wouldn’t have happened without them & love how that little scrap of Batik brought it to life. Have spent all day making a summer nightgown with the delcious assortment of laces and cloths you sent for xmas, the lace yoke made a perfect starting point & I am loving the Singer for sewing the seams, feels like deja vu or maybe i used one in a past lifetime! i don’t know how i managed to miss the hopeful lunacy scarf! indeed, now i don’t know where to begin to express the emotion and memories and hopes that it inspires in me as i contemplate it. so many worlds. dreams. lessons. my stars!! Gosh! Thanks for the kind words Joe, 2013 is going to be an amazingly magical year & we are so lucky to have ended up in this amazing community of cloth conjurors! Enjoying the creative buzz in this post. 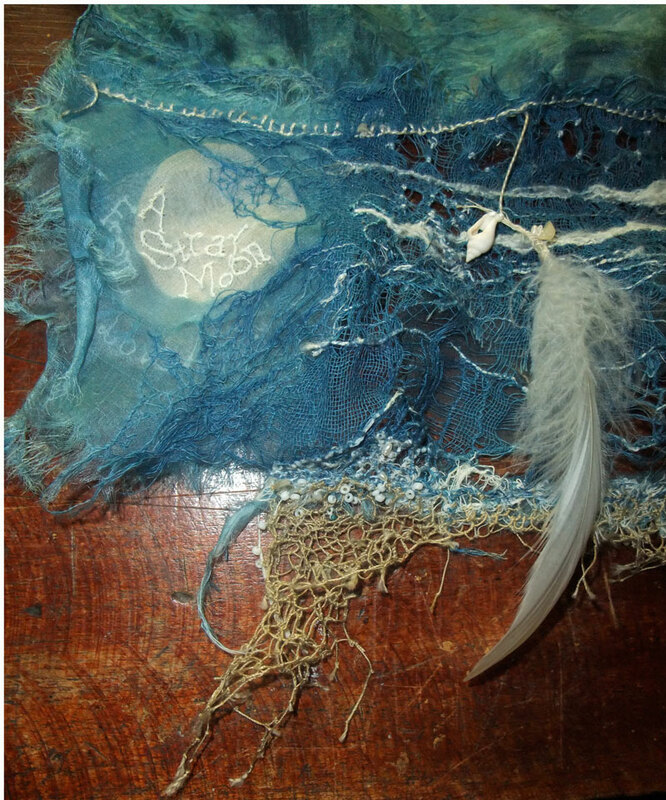 Oh the feathers sewn into your Hopeful Lunacy Scarf…. and the name …. wonderfully whimsical! Happy New Year Mo! Looking forward to many more good conversations and inspirations Robyn Happy New Year! Love your tree, it is so delicately stitched. this is a beautiful post and I am honoured to be mentioned in it, thank you. I also wanted to say that I love your thoughts on bringing things ‘out of the cupboard’…food for thought. 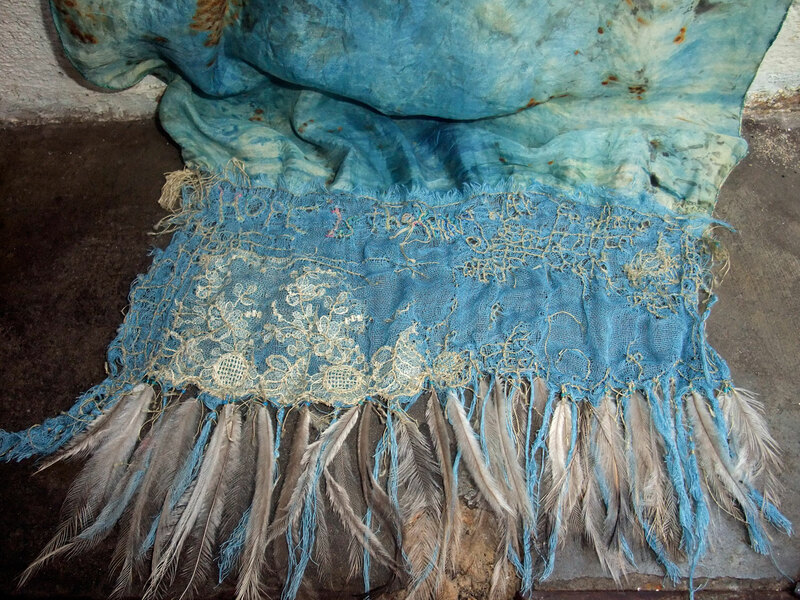 I have been given two embroidered linen hankies and a table runner in the last few years that are exquisite examples of embroidery yet have never been used and are all at least 50 years old. I want to figure out a way to both use & honour them at the same time. it’s okay to visit completely out of sequence, right? 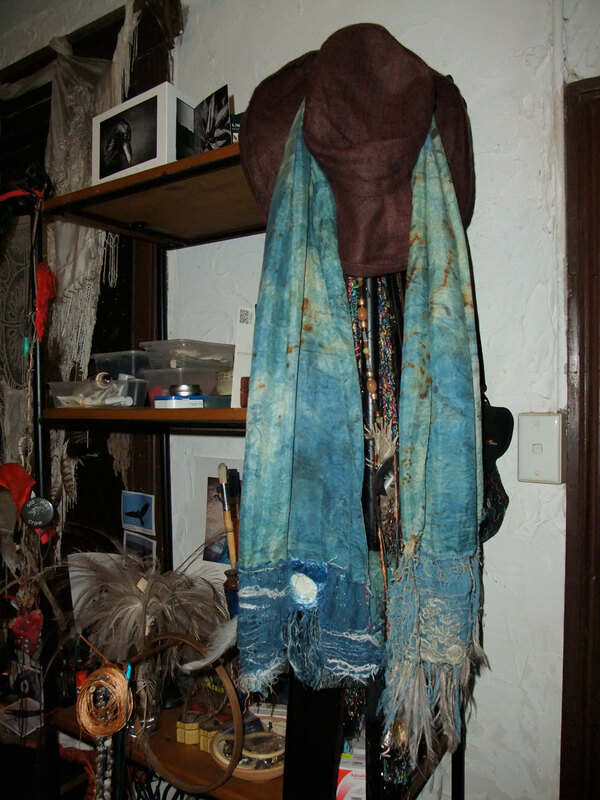 landed here tonight, mid-April, 2013, and agog at your vision and witchy way with images and animals… the scarf is amazing. but then so is the tree embroidery. 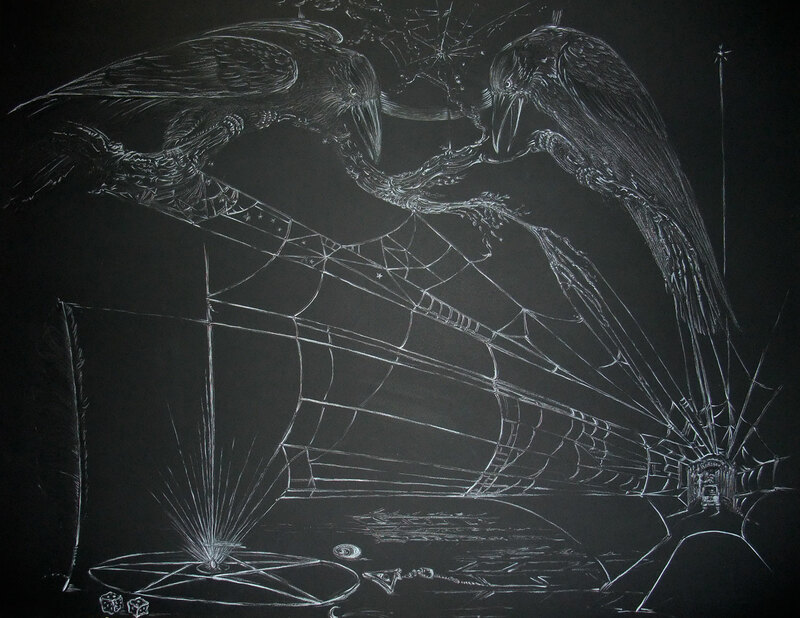 and the CroWs!! Life of Pi is a must see in 3D!